Personal Blog of Jillian Tate. This morning, I was skimming Facebook and saw that a group of women from my office had gone out for drinks last night to celebrate a former colleague’s. My absence from this group is not particularly telling or indicative of anything to do with me or my value as a person, colleague or friend. It is just a group of current co-workers who have been going out as a group for years, while I sit anti-socially at my desk. In fact, my anti-social status at the office is so extreme that I am missing the company picnic today because I didn’t cross-reference my work and personal calendars before making plans for the school closure dates. Therefore, I am hosting Ben’s friends for a day of “please entertain each other” activities instead of re-bonding with my own co-workers. Part of this is because I’ve been offsite for the past year, and upon returning, instead of attempting to re-bond with colleagues, I decided to hide at my desk and pretend I don’t know anyone anymore. My failure to prioritize this kind of in-office socializing is probably why I am rarely invited to events outside the office. On a daily basis, I make the choice not to get up from my desk and talk to people, which results in not being invited to events outside of the workday. And for the past few years, I have prioritized my son’s birthday over the company picnic – and then this year, the one year I could have gone, I invited three of his buddies over to hang out instead of sending Ben to chess camp for the day, so I am now committed to staying home with a houseful of ten year olds. It therefore should not be a surprise that I’m not invited to office social gatherings, and yet, I’m still sad and disappointed when it happens and I see it posted about retroactively. It’s just so hard to get over my fear of socializing at the office. I worried for years that people didn’t like me, and only put up with me because they were obligated to engage with me, a fear everyone has but that I actually had reinforced in me twenty years ago by a co-worker who told me that was how she felt. Now I not only worry people don’t like me, but also worry that the obligation to engage positively with me is higher since I am management and sometimes, I am someone’s direct or indirect boss. This is not a surprising phenomenon to many people, I’m sure. There’s mixed feelings on work friendships. TV teaches us that it’s the norm to have a workplace social circle, but I have never had that kind of extended work/social life. I am friendly with co-workers, and often remain good friends with people after leaving a job, but it isn’t a regular occurrence to have that kind of interaction. I do not believe this is abnormal, especially for people with children and/or other priorities outside the office, and the New York Times seems to emphasize that work friendships can be weird and inconsistent by running articles on a regular basis talking about issues that crops up in these strange hybrid relationships. Is there a not-awkward, non-creepy way to make friends as a grown-up? It would be easy to be safe and just cocoon further into my loner, anti-social status, but that isn't what I want. I know that my co-workers are people I would like spending time with if I wasn’t so anxious about it. The problem is that added stress of thinking, “does this person like me or are they just putting up with me” kills most of the joy I would get from the encounter, and makes it difficult for me to reflect positively on the fact that this is a cool, smart, interesting person with their own perspective on the workplace we share and have in common. It’s difficult to engage in a positive, meaningful conversation during a workday as it is – I’m always worried I’m keeping someone from something more important – and then my fear of whether or not my presence is received the same way makes it even more difficult for me to engage in a verbal exchange that would add collateral to the friendship. Therefore, I’ve been hiding at my desk, nodding at people when I see them, smiling and saying hello, and praying I don’t have to actually engage because THAT IS HARD AND CAUSES FEAR. I empathize with this SO HARD. 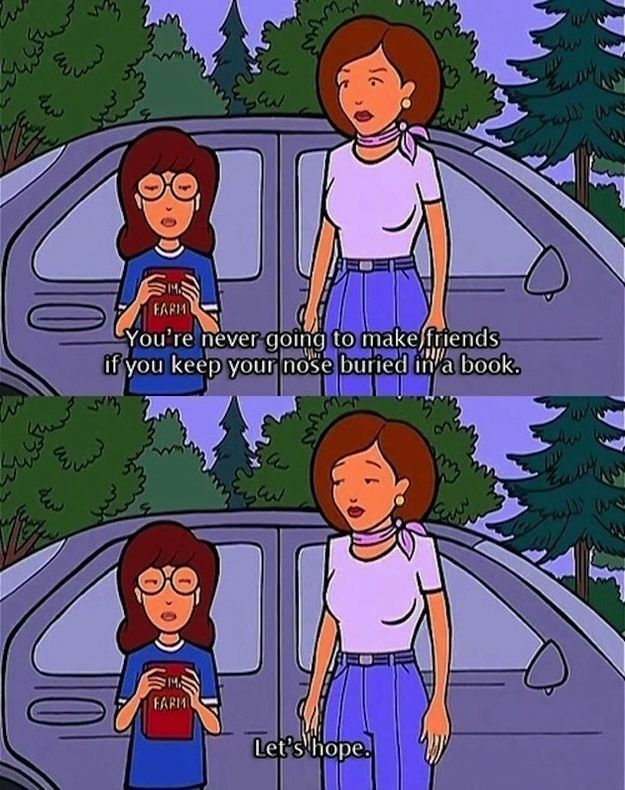 It’s how I know Daria is really covering for insecurity! I’m asking myself now, what can I actually do about this? Do I have to come out and talk to people and put myself out there despite a crippling fear of rejection? Do I have to make going to company events and happy hours more of a priority? We’re moving to a new office soon, after all – can I make it a priority to talk to people there? Can I engage more through the “Women in Leadership” initiative, making sure I show up for those events? Would it help if i went into the office more days instead of working from home all the time? What if I reached out more to co-workers, current and former, attempting to get to know them on a 1:1 basis and setting aside time to do so? The answer to all of these things is yes, and the answer to everything is that I have to just work a little harder at engaging in meaningful social interactions, both in creating the opportunity to do so and in finding conversation to make that isn’t awkward when those opportunities come up. That isn’t easy for me – I sometimes feel like I’m missing a critical part of the human personality, the part that puts people at ease and makes people feel comfortable with me, the part that makes me likeable. That, however, is an insecurity for an entire other day. For today, I need to go problem solve a way to get to that company picnic! This entry was posted in life, work and tagged bonding, co-workers, colleagues, friends, people, professional, professionalism, social, socializing, work, work friendships. Bookmark the permalink.